Ernestine is in over her head. Monday through Sunday, Ernestine’s week is packed with after-school lessons—tuba, knitting, sculpting, water ballet, yoga, yodeling, and karate. Overwhelmed and exhausted, Ernestine decides to take matters into her own hands and heads off to the park with her Nanny where she builds a fort, watches the clouds, and plays all kinds of unstructured and imaginative games. But when a teacher calls Ernestine's mom to report that she has not shown up for yodeling, her parents search everywhere until at last they hear their daughter's laughter coming from the park. Ernestine tells her parents what a wonderful afternoon she's had, and explains her plight, asking, "I like my lessons, but can't I stop some of them?" This saga hilariously captures the dilemma of the modern-day over-scheduled child in riotous color and absurd extremes. 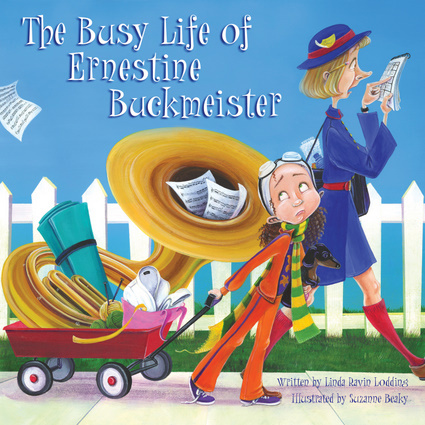 A delightful heroine, Ernestine will be sure to put “play” back on everyone’s agenda, demonstrating that in today’s overscheduled world, everyone needs the joy of play and the simple wonders of childhood. "This book is a joyful and funny reminder to kids and parents alike about the importance and power of play. . . . Our children will all be happier and healthier if we lessen all those lessons and get out to play." —Darell Hammond, CEO and cofounder of KaBOOM! Linda Ravin Lodding works abroad in media and public affairs for the United Nations. Suzanne Beaky is the illustrator of the Hailey Twitch chapter book series and several picture books. She is a recipient of the Ellen Dolan Memorial Mentorship Award from the Society of Children's Book Writers and Illustrators in Missouri. She lives in Kirksville, Missouri.